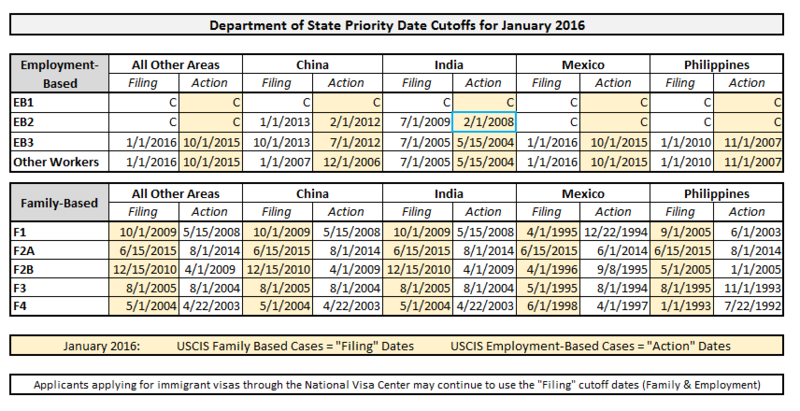 The Department of State has released the January update to the Visa Bulletin. Meanwhile, USCIS will continue to keep people guessing every month as to which set of priority dates will be in effect. In September, the Department of State surprised everyone by announcing that there would be two different priority date charts going forward. The ‘old’ priority date chart would continue on as the “Final Action” chart, and would be used to indicate when an actual visa number is available, allowing final adjudication of a permanent residence application. In addition, they introduced a new “Dates for Filing” chart, which had priority date cutoffs ranging from a few weeks to a few years earlier than those found on the Final Action chart. This would allow people stuck in a long line to submit applications a bit sooner, meaning they would have earlier access to AC21 portability and would be able to submit EAD/AP applications earlier. But at the very last minute, the Department of State announced major changes to the “Dates for Filing” chart, revising some dates backwards by years. USCIS has indicated that in January – as in December – family-based applications will be accepted according to the “filing” dates, while employment-based cases will be accepted based on the older, slower-moving “final action” cutoff dates. Many “Filing” dates in the family-based categories advanced 3-6 months. Final Action dates advanced more slowly (or not at all) across all categories, expect India EB-2, which has now advanced 18 months since the November Visa bulletin. There were no retrogressions this month. The complete chart is below (click to enlarge).